Surveying the scale of an embezzlement scandal that has rocked Iran, the head of the country's judicial investigation unit called it "the most unprecedented financial corruption case in the history of Iran." But with $2.6 billion believed to have been defrauded from several Iranian banks, says Iran watcher Jamshid Assadi of France's Burgundy School of Business, investigative head Mostafa Pour Mohammadi is being modest in his claims. "This scandal has been really exceptional," says Assadi. "You cannot find any similar -- proportionally, if you consider GDP -- financial scandal, banking scandal in any country." 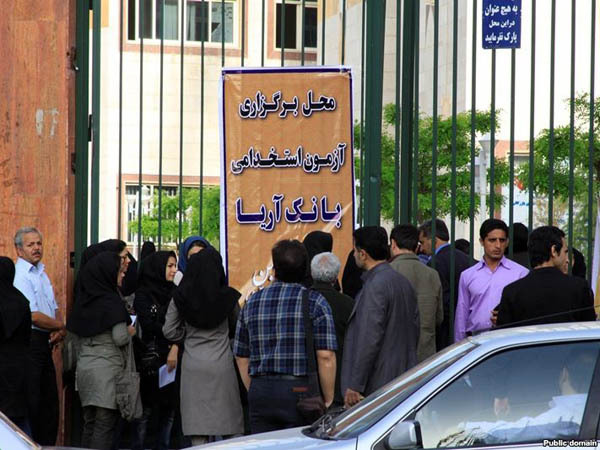 The alleged fraud, which is thought to date back to 2007, involved a series of banks loans including from one of Iran's top financial institutions, Bank Saderat. Those loans, in turn, were used to purchase privatized companies which were then used as collateral for further larger loans. Despite the magnitude of the claimed fraud, Iran analyst Meir Javedanfar of MEEPAS, an Israel-based think tank, says what is more remarkable is the fact that the scandal ever came to light. "This is the first time this kind of news is being made public in Iran," says Javedanfar. "Because I don't think this is the first time there has been fraud in Iran. I think it is possible that fraud bigger than this has been carried out before and we did not know about it because the government wanted to keep it quiet. But I think the reason now we are hearing about this kind of fraud is because political score-settling between different factions in Iran." The revelations of the scandal are seen as an oblique attack on President Mahmud Ahmadinejad, carried out through his key allies. The Iranian state media on September 12 reported that the assets of Iranian billionaire tycoon Amir-Mansour Aria have been frozen as part of the investigation into the fraud. Aria is reported to have close links with Esfandiar Rahim Mashaei, Ahmadinejad's chief of staff. Mashaei has been a target of the ruling clerics, with the hard-line "Kayhan" newspaper describing him as a "deviant current" of Ahmadinejad allies. Dozens of Ahmadinejad supporters have been arrested in the past few months. The timing of the fraud revelation is also crucial to understanding the motivations behind the investigation, according to Assadi. "Ahmadinejad wants to go to New York [for this week's UN General Assembly debates] and he really wants to have negotiations with the States," says Assadi. "If he has any success with that...his faction is going to be much stronger than other factions. So the other faction does everything to prevent Ahmadinejad and his faction from having more credit and more power." The scandal also sheds light on the magnitude of the problem of corruption facing Iran. Mehrdad Emadi, chief consultant for the U.K.-based Betamatrix consultancy, says the latest banking scandal reveals how endemic corruption has become within the Iranian regime. "It was really not a haphazard or just an individual corrupt case, because it was very well orchestrated and coordinated, definitely, with people in position of power and to make this happen," says Emadi. "This is the most disturbing part -- the system has gone corrupt so deeply against itself that this kind of theft seems to be quite attractive to people in high places." The problem of corruption has dramatically worsened since Ahmadinejad came to power in 2005, according to the international anticorruption watchdog Transparency International. In its annual index on corruption, Iran has fallen 58 places since 2005, to 146 out of 180 countries. Iranian authorities have pledged to bring all those responsible for the alleged banking fraud to justice. Already several banking employees have been arrested. But how far the investigation goes depends on the political allegiance of those involved, says Iran analyst Javedanfar. "If the supreme leader is against the people who have carried out this fraud, they...should be losing their influence and quiet possibly going to jail," says Javedanfar. But Burgundy School of Business's Assadi doubts how far the investigation can go. He says Ahmadinejad has already indicated that his opponents are too vulnerable to corruption allegations. "I don't think its going to go very far," says Assadi. "This is a kind of competition. They want to put pressure on the other fraction to get some concession, and for sure they cannot go that far because all of them they have done things like this." In the past few months, Iranian media have reported a series of major fraud cases in the banking system and government agencies. In 2008, the country settled its biggest fraud case to date when an appeals court sentenced an Iranian businessman and a former adviser to parliament's economic commission to 11 years in jail. But the latest scandal threatens to dwarf everything before it. Intelligence Minister Heidar Moslehi has vowed to recover all of the estimated $2.6 billion that's missing. But Betamatrix's Emadi says the money is probably already out of the country, despite stringent international financial controls on Iran. "We still have these small- and mid-sized banks who think they can actually fly under the radar of money laundering," says Emadi. "In that context, that it is still possible for elements of this leadership to smuggle out close to two and a half billion U.S. dollars. Truthfully without the internal disclosure of this issue, we would be sitting here having different conversations because there were no indications outside the country that this was happening." With Iranian parliamentary elections due in March, along with political jockeying on who might succeed Ahmadinejad in 2013, the battle between the president and his opponents is expected to intensify. And with this battle, observers say, comes the likelihood of more revelations of corruption.